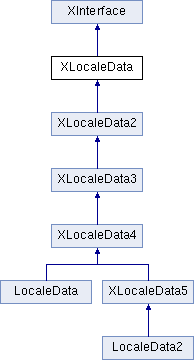 Access locale specific data as it is defined in XML locale data files compiled into the binary data libraries liblocaledata*.so respectively localedata*.dll. For XML locale data files definitions see the DTD file. returns all LC_CALENDAR calendars for a locale. returns all LC_CURRENCY currencies for a locale. returns all LC_FORMAT format elements for a locale. returns all LC_COLLATION collation options for a locale. returns all LC_COLLATION collators for a locale. returns all LC_MISC forbidden characters for a locale. returns the LC_INFO locale information. returns LC_CTYPE separators and markers. returns all LC_MISC reserved words for a locale. returns all LC_SEARCH search options for a locale. returns all LC_TRANSLITERATION transliterations for a locale.